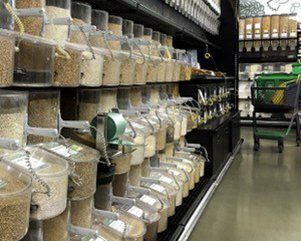 With nearly 1,000 bins of bulk food, the Honest Weight Food Co-op in Albany, NY offers all of the grains covered in the nine Chapter Headings of Sara Pitzer’s Homegrown Whole Grains: 1) barley, 2) buckwheat, 3) corn, 4) heirloom grains (amaranth, quinoa, spelt, emmer faro, einkorn), 5) millet, 6) oats, 7) rice, 8) rye and 9) wheat. And all are organic: Wow! If you are an avid baker, wanting to take your bread baking to the next level or perhaps a locavore looking for the next food frontier in taste . 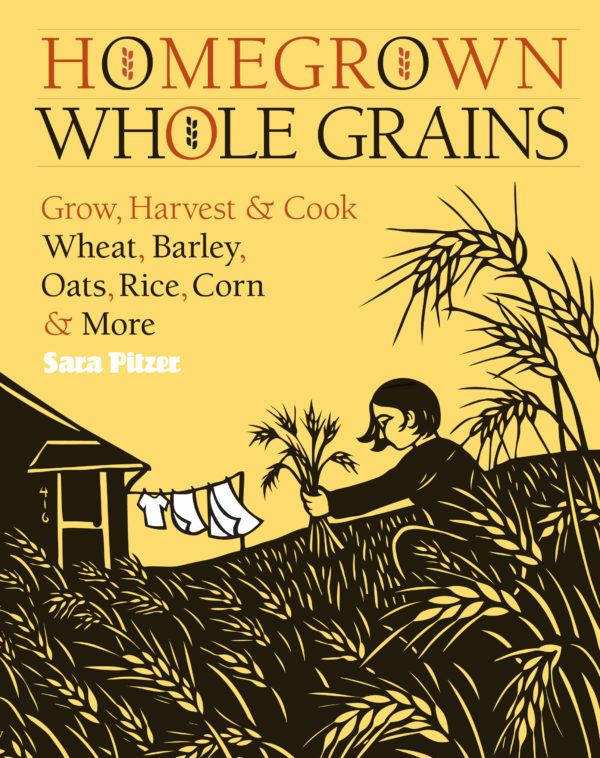 . . or if you’re simply interested in learning more about the grains we take for granted, then Sara Pitzer’s Homegrown Whole Grains, Grow, Harvest & Cook Wheat, Barley, Oats, Rice, Corn & More (Storey Publishing, North Adams, MA, 2009) deserves a place in your library. We don’t think twice about growing green beans, sweet corn or tomatoes in a vegetable garden. So why not wheat or rye or spelt? While reading Amy Halloran’s The New Bread Basket, How the New Crop of Grain Growers, Plant Breeders, Millers, Maltsters, Bakers, Brewers, and Local Food Activists Are Redefining Our Daily Loaf for purposes of a book review on this website, I became curious about growing grains in my backyard garden in rural Albany County in upstate New York. After all, upstate New York was the breadbasket of America until the Erie Canal in the early 19th century opened up the vast and fertile Midwest to cultivation. In our time, the fertile midwest has become the locus for the industrial-sized, mono crop growing of commodity wheat, corn and soy, with the main focus on economics and profits overwhelming concerns for taste, freshness, and bio-diversity. In Sara Pitzer’s introduction to Homegrown Whole Grains (which is actually a new, updated edition of her Whole Grains, Grow, Harvest & Cook Your Own, written nearly thirty years ago and published by Garden Way, Inc. in 1981), she explains that the first version was written during the back-to-the-land era when “hippie food” was long on nutrition and short on taste. This new, updated edition was written for a new generation of local food enthusiasts. It is a concise manual for growing, harvesting, and cooking homegrown grains. Organized by type of grain, Pitzer outlines seed sources, culture requirements, possible pests and diseases, best ways to process the harvest, and a collection of kitchen-tested recipes. Her descriptions and yield expectations are based on a modest-size plot of 100 square feet, right-sized for many backyards. She cautions that while growing grain is fairly easy, threshing, winnowing, and hulling take lots of energy, verging on brute force. Some gardeners may prefer to plant grains as cover crops, or simply to buy unprocessed organic grains in the bulk department of a local food co-op. Wherever you enter the process, Pitzer has clear, practical advice and sources for buying, storing, grinding, and cooking a wide variety of grains: barley, buckwheat, corn, amaranth, quinoa, spelt, emmer farro, einkorn, millet, oats, rice, rye, or wheat. Between each well-organized grain section are inspirational profiles of grain “enthusiasts” from around the country. 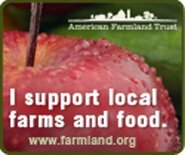 The final Resources section includes sources for seeds, hand mills, advocacy groups, and more books. Though I probably won’t be growing grains in my backyard any time soon, I do plan to keep Homegrown Whole Grains on my cookbook shelf for its simple and clear recipes and nutritional information. A perfect companion to The New Bread Basket, Sara Pitzer deserves much credit for providing guidance in Homegrown Whole Grains on what to do with all those mystery grains in the bulk food department of a food co-op, like that of the remarkable Honest Weight Food Co-op in Albany, NY, with its nearly 1,000 bins of bulk food.